Concert going is a funny thing. You bring yourself to it, you the subject. It's swimming in a sea of subjectivity. It's part where you're at, the day you've had, your specific brain chemistry at this moment that is you. So relating meaningful expression is probably somewhat futile. ... but still we try. If there's any hope of sense and meaning, it's lost in the deferring / differing context [différance even]. We fall through the cracks. 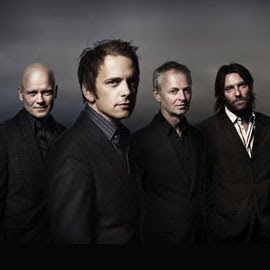 So what of the Tord Gustavsen Ensemble? Well, you know, I don't know if I know. I was lost in all the above. The first twenty seconds were suitably delicate. But the gap was wide tonight, and I fell down much of the time. Gustavsen's thing is languid and diffuse. It's his thing, it's part of the appeal. The breathy song introductions stage an unconvincing reverence. Much of it is good I think. 'Being There' was there, but the piano needs much more space in this sound, as so much effect is in subtle specific nuances. The meanderings of sax player Tore Brunberg sadly rode roughshod over these, masking and obliterating the fragile piano textures and harmony. There was an interesting solo from double player Mats Eilertsen with some nice fast argeggiated plucked chords resonanting with distinctly folk tones. At some points the TG Ensemble visibly kicked, Gustavsen swaying and sliding across the piano stool in seeming abandonment, but the aural effect was, even then, surprisingly restrained. There was just about enough energy to rouse a few genuine post solo rounds of applause here and there. Drummer Jarle Vespestad played his part, tinkling, tapping and scratching in all the usual places. It adds to the overall wash, but doesn't engage much despite a tasteful, if reserved, solo. A not unpleasant evening but as I say, lost in the gaps. In another one of my occasional reports from further afield, I caught the really rather fine MusicMusicMusic last night at the splendid Nefertiti club in Gothenburg, Sweden. This piano led trio is headed up by the suitably quirky looking Fabian Kallerdahl on the grand piano and Zawinul style mono synth. He looks a little like a cross between Monk and Bugge Wesseltoft, and that’s not a half bad pass at describing the music neither. The group have a fine sense of swing when the mood takes them, and there’s plenty of satisfyingly chop and change metrical trickery in just the right amounts. I particularly loved drummer Michael Edlund’s groove, especially on the last track that reminded me of the grace of later Talk Talk (soz dunno what the song was called, my Swedish isn’t up to it). Double bass player Josef Kallerdahl was bang on too, favouring the use of a bow for many of his high register solos which worked a treat. The last song before the encore was a real nice n’ tasty rework of the funk soul classic ‘September’ that went down famously with the packed Nefertiti. The club has a great vibe too. Well worth a visit if you’re in this neck of the woods. The occurrence of a welcome return to the newly reopened and refurbished Band on the Wall happened last night for an initially somewhat phased looking Mike Walker with his Sextet. The place doubtless now has a different atmosphere, one which Mike admitted threw him for a song or two, with him having many strong memories of the place in its previous less reverent guise. Mike showcased much of the material from the 'Madhouse and the Whole Thing There' album, as well as material from last year's Manchester Jazz Festival commission, 'Ropes' and a couple of new tunes. The set opened with a familiar cover of Steve Swallow's 'Ladies in Mercedes'. Keyboard player Malcolm Edmonson's synth was a bit plinky for my taste on this whilst the overall sound was bedding down. A fast angular take on 'Solar' followed to warm things up. Mike announced that the next song, 'A Real Embrace' was for Annie, his mum, the solo guitar introduction of which was really quite familially moving. A gorgeous duo version of 'Clockmaker' from Mike and Les Chisnall on the grand piano was wistful and reflective in a suitably autumnal way. The pace and fire then upped for a complex new song, 'Laugh Lines'. Some fast bop playing from Iain and Mike hit the sweet spot, and the closing unison head was delivered with satisfying precision. The expansive 'Madhouse and the Whole Thing There' track opened the second set. This is a personal fave of mine, and it gives Mike a great opportunity to stretch out and blow with real force. Others at the Band on the Wall last night clearly agreed, as this track was the best received track of the night. The time signature metrical tricks of 'EAminG' gave drummer Pat Illingworth a chance to earn his money and kept double bass player Steve Watts honest to boot. I wasn't entirely convinced by this track so I will reserve judgement for another hearing. The unison horn and guitar line did have a certain digital pitch shift quality not unlike our blessed ring modulator. The keyboard strings worked best on a charming version of 'Wallenda's Last Stand', the parts sounding convincing capturing the wind gust effect that knocked poor Wallenda off his rope for the last time. Les Chisnall was once again a delight on this one. Some more bristling fire storm guitar from Mike finished a fine evening on the, once again, wrong footing meter of 'Dad Logic', and the encore sweetness of 'Safe Home' sent us home with smiles on our faces. P.S. Despite a bust amp requiring a loan replacement from a local mate, last night's gig at The Continental in Preston (Sat 10th October) was phenomenal. Mike was a good as you'll ever hear him, particularly on the 'Madhouse and the Whole Thing There' track. Really glad I made the effort to go. The Continental's a great venue as well.